1.1 These are the terms and conditions that apply to and form part of Your Rental Agreement with RedSands Campers. 1.2 These terms and conditions are to be read with the Schedule. Accident, Accidental or Accidentally means an unintended, unforeseen, fortuitous or unanticipated happening or mishap which is not expected or designed. Bond means the sum of $5,000 in the case of a RedSands Toyota Prado Vehicle; and the sum of $8,000 in the case of a RedSands Camper Vehicle, paid in accordance with clause 9. Camping Accessories means any roof top tents, mattresses, linen, refrigerators gas burners, cookware, cutlery, tableware, utensils, tables, chairs and any other camping accessories supplied by RedSands. but excludes reasonable wear and tear. Excess means $5,000 or, if 4WD Wander Far Coverage has been obtained in accordance with clause 21, the applicable Excess under that clause. GST has the meaning used in the A New Tax System (Goods and Services Tax) Act 1999 (Cth). (c) the Vehicle or Camping Accessories being repaired or replaced on account of an event for which You are liable under clause 16. (d) You or any other person standing or sitting on the roof of the Vehicle. PPSR means the Personal Properties Securities Register established by the Personal Property Securities Act 2009 (Cth). Public Holiday means a day that is a public holiday at the location where the Vehicle must be collected or returned, as specified in the Schedule. RedSands/RedSands Campers means RedSands Campers Pty Ltd ACN 609 480 177 as trustee for the Winderabandi Family Trust. 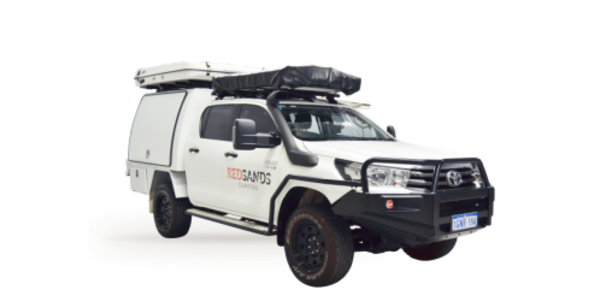 RedSands Camper Vehicle means a Vehicle that is a RedSands camper vehicle and which includes Camping Accessories. RedSands Toyota Prado Vehicle means a Vehicle that is a Toyota Prado vehicle and which does not include Camping Accessories. Rental Agreement comprises the document titled “Rental Agreement – Schedule” and these terms and conditions. Rental Period means the hire period referred to in the Schedule or any extension or variation to that period which has been agreed between You and RedSands. Schedule means the schedule which forms part of the Rental Agreement and is the document titled “Rental Agreement – Schedule”. (c) consequential loss suffered by a third party. (c) the Vehicle’s contact with any object or obstruction including (without limitation) kerbs, gutters, speed or road bumps, barriers, wheel stops, rocks, ruts, debris, river beds, sand or ridges. Vehicle means the four-wheel drive vehicle specified in the Schedule and includes all tools, components, keys, keyless start devices, remote control devices, audio equipment, manufacturer’s standard tools and accessories, and non-standard items, tools or equipment supplied with or fitted to the Vehicle but excluding the Camping Accessories. 4WD Wander Far Coverage means the reduction in Excess and liabilities as described in clause 21. You/Your/Yourself means the hirer of the Vehicle and each person noted as a driver in the Schedule. Where in this Rental Agreement there is a reference to Your liability and there is more than one of You, Your liability is joint and several. 3.1 You agree to hire the Vehicle and, if applicable, the Camping Accessories from RedSands for the Rental Period, at the rates and charges set out in the Schedule and otherwise in accordance with the Rental Agreement. 3.2 Unless otherwise agreed, the minimum Rental Period for the Vehicle is seven days (“Minimum Rental Period”). The Minimum Rental Period may be varied by agreement between the parties. RedSands is under no obligation to agree to a variation to the Minimum Rental Period. However, if RedSands is willing to do so, it will advise You prior to entering into this Rental Agreement. 3.3 Rental days are calculated on a calendar day basis. When calculating the number of days the Vehicle and Camping Accessories are rented, the day of pick up is counted as day one of the Rental Period, regardless of pick up time. The day of the return of the Vehicle and Camping Accessories is counted as the final day of the Rental Period regardless of the return time. The Vehicle and Camping Accessories must be returned by 4.00pm on the final day of hire if the return day is a weekday, or by the time specified in the Rental Agreement if the return day is a Saturday, Sunday or Public Holiday. 3.4 Late pick up or early return of the Vehicle or Camping Accessories does not entitle You to any refund of the unused portion of the Rental Period. 4.1 Full payment of the estimated total hire charges calculated at the daily hire rate (including all ancillary fees and charges) for the duration of the Rental Period plus the amounts payable pursuant to clause 9 (Security Bond) or clause 21 (4WD Wander Far Coverage) is due and payable in accordance with clauses 9 and 10. (b) unless stated otherwise, inclusive of any GST. (b) will be taken to have been paid upon receipt of sufficient cleared funds in Australian dollars into RedSands’ nominated bank account (in the case of payment by direct debit) or upon receipt of a notification from the credit card issuer that a charge to Your credit card for the required amount has been approved (in the case of payment by credit card). 4.4 You acknowledge that advertised rates are subject to change. All hire rates applicable to Your hire will be calculated as at the time of booking regardless of any subsequent change to advertised rates. 4.5 Any refunds due to You under the Rental Agreement will be refunded to You in Australian dollars. 4.6 Where RedSands is required to refund amounts previously paid by You in a currency other than Australian dollars, there may be a difference between the amount initially paid by You and the amount repaid by RedSands due to exchange rate fluctuations and bank fees. RedSands accepts no liability for any such difference and You accept all exchange rate fluctuation risks and liabilities for bank fees. 5.1 The Vehicle and any Camping Accessories must be collected and returned by You at the time, date and location specified in the Schedule. Vehicles or Camping Accessories collected or returned outside of these hours, on a gazetted public holiday or on a weekend may incur a fee of $150 in addition to any other late fees and charges payable. 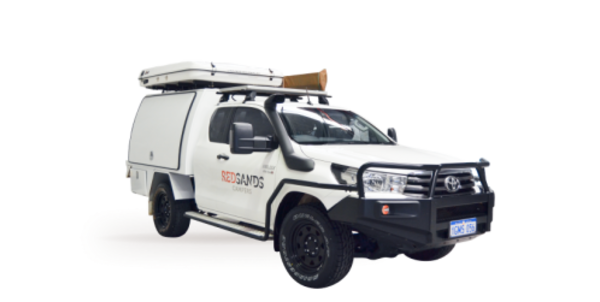 5.2 RedSands will provide the Vehicle and Camping Accessories to You in a clean and tidy condition, in good working order and, in the case of the Vehicle, with a full fuel tank. 5.3 You must return the Vehicle and Camping Accessories on the return date, at the return time and to the location set out in the Schedule. The Vehicle and the Camping Accessories must be returned to RedSands in a clean and tidy condition, in good working order (except for reasonable wear and tear) and, in the case of the Vehicle, with a full fuel tank. 5.4 If You do not return the Vehicle with a full fuel tank, You will be charged a re-fuelling fee of $3 per litre to re-fuel the Vehicle. (c) contaminated by the presence of animals. This fee is in addition to Your other liabilities under this Rental Agreement, including in relation to Damage. 6.1 Any request by You to change the time or date when the Vehicle or Camping Accessories are to be returned to RedSands, or the return location, is subject to the prior approval of RedSands, in its absolute discretion. Without limiting the exercise of that discretion, RedSands may refuse to approve any change if the Vehicle or Camping Accessories are not available, or are required at a particular location for a booking by another party. 6.2 If RedSands is willing to approve a change to the time or date when the Vehicle or Camping Accessories are to be returned to RedSands, or the return location, You will be required to pay additional fees and charges. You will be notified of the additional charges applicable prior to the change having effect. 6.3 Payment of all additional fees and charges applicable to any changes requested by You must be received by RedSands before the change has effect. 6.4 You acknowledge that if You fail to comply with this clause and return the Vehicle or Camping Accessories at a time or date, or to a different location than that specified in the Schedule without prior approval from RedSands and payment of all additional fees and charges, You will have breached the Rental Agreement. You will also be liable to RedSands in accordance with clause 7, in addition to any other liability under this Rental Agreement. 7.1 If the Vehicle or Camping Accessories are not returned by the time and date set out in the Schedule or as agreed in accordance with clause 6, in addition to Your other liabilities under the Rental Agreement, You will be liable to pay a late return charge of two times the daily hire rate for each day or part day that the Vehicle or Camping Accessories are not returned plus the daily 4WD Wander Far Coverage payment, if applicable. 7.2 If the Vehicle and Camping Accessories are not returned to the return location set out in the Schedule or as agreed in accordance with clause 6, in addition to Your other liabilities under the Rental Agreement, You will be liable to pay for the transportation of the Vehicle and Camping Accessories to the agreed return location plus a late return charge of two times the daily hire rate for each day or part day from the end of the Rental Period to the day that the Vehicle and Camping Accessories arrive at the agreed return location. 7.3 You will continue to be responsible for the Vehicle and Camping Accessories until they are returned to RedSands and checked in by a RedSands’ staff member at the agreed return location. 8.1 RedSands will use reasonable endeavours to supply the Vehicle that was nominated at the time of booking. 8.2 If due to circumstances which were not reasonably foreseeable at the time of booking, the Vehicle or Camping Accessories are not available, RedSands may supply a vehicle or camping accessories which are substantially equivalent to the Vehicle or Camping Accessories nominated at the time of booking. Where this occurs, the substituted vehicle or camping accessories will be regarded as the Vehicle or Camping Accessories (as applicable) for the purposes of this Rental Agreement. 8.3 Subject to clause 4.6, if RedSands is unable to supply a vehicle or camping accessories which are substantially equivalent to the Vehicle or Camping Accessories nominated at the time of booking, and You do not elect to hire a different vehicle or camping accessories in accordance with clause 8.4, You are entitled to a full refund of the amounts You have paid under this Rental Agreement. If this occurs, this Rental Agreement comes to an end and RedSands is not liable for any other costs or losses incurred by You, however arising. 8.4 If RedSands is unable to supply a vehicle or camping accessories which are substantially equivalent to the Vehicle or Camping Accessories nominated at the time of booking, RedSands may, subject to availability, offer You a different vehicle or camping accessories. The offer may be made subject to an adjustment to the rates and charges set out in the Schedule and the amounts which You must pay under the Rental Agreement if You accept the offer. (e) RedSands is not liable for any other costs or losses incurred by You, however arising. 9.1 Unless You have purchased 4WD Wander Far Coverage, You are required to pay RedSands the Bond as security for the performance of Your obligations under this Rental Agreement. 9.3 If you elect to pay the Bond by direct deposit into a bank account nominated by RedSands, you must make payment no less than 5 days prior to the collection of the Vehicle. 9.4 Payment by direct deposit is only regarded as being made when cleared funds have been received into the bank account nominated by RedSands. 9.5 If you elect to pay the Bond by credit card, you must make payment prior to the collection of the Vehicle. 9.6 If payment of the Bond is made by credit card, only MasterCard, American Express and Visa cards are accepted by RedSands and an administration fee of 2.5% will also be charged. The administration fee is refundable to the same extent (and in the same proportion) as the Bond is refundable pursuant to this clause 9. The credit card used must be in the name of the hirer of the Vehicle or a person noted as a driver on the Rental Agreement. 9.7 You acknowledge that the time limits in clauses 9.3 and 9.5 must be strictly adhered to. 9.8 Subject to this clause 9, the Bond (and any administration fee paid) will be repaid to the person who paid it if, after the conclusion of the Rental Agreement, there are no amounts for which You are liable to pay to RedSands pursuant to this Rental Agreement or on account of Your hire of the Vehicle or Camping Accessories. 9.9 You acknowledge that RedSands requires time to assess Your liability once the Rental Period has come to an end. For this purpose, RedSands may withhold repayment of the Bond for a period of up to 21 days from the end of the Rental Period while that assessment is made. (b) the Bond exceeds Your liability, RedSands must repay to the person who paid the Bond, the balance and the proportion of any administrative fee which was paid on that balance. 9.11 RedSands will provide You with an itemised invoice showing the amounts set-off pursuant to clause 9.10. (b) apply that estimate against the Bond in accordance with clause 9.10. (b) if the assessment exceeds the assessment, You will remain liable for, and must immediately pay, the difference to RedSands. 9.14 RedSands may apply the Bond in the manner contemplated by this clause 9 notwithstanding that there is, or is likely to be, a pending claim by RedSands under an applicable policy of insurance in relation to Your liability. RedSands may require you to pay an additional sum reflective of the loss suffered or likely to be suffered by RedSands in relation to the event. 9.17 The additional sum referred to in clause 9.16 is to be held and may be applied in the same manner as the Bond. 9.18 Any failure by You to pay any sum required by RedSands pursuant to clause 9.16 is a material breach of the Rental Agreement. 10.1 If You wish to purchase 4WD Wander Far Coverage, You must provide a credit card pre-authorisation in accordance with this clause 10 instead of a Bond. 10.2 The credit card pre-authorisation must be provided prior to your collection of the Vehicle. 10.3 Only MasterCard, American Express and Visa cards are accepted by RedSands for pre-authorisation. The credit card used must be in the name of the hirer of the Vehicle or a person noted as a driver on the Rental Agreement. (b) 4WD Wander Far Coverage – $500 Excess: $500. 10.5 If You cancel Your credit card for any reason during the term of the Rental Agreement or during the Rental Period, including to avoid payment for any Damage, Third Party Loss or any costs associated with Your use of the Vehicle or Camping Accessories, that conduct will be regarded as a material breach by You of the Rental Agreement. (d) which shows Your current residential address. 11.2 If You only hold a motor vehicle driver’s licence issued in a country other than Australia, You acknowledge that laws and driving regulations may differ in each state and territory of Australia. For example, in some places in Australia, You are required to, among other things, carry an international driver’s licence or permit. In other places, You may be required to, among other things, carry Your licence obtained outside of Australia and, if it is not in English, a formal translation of Your licence into English. Without limiting clause 12.10, it is Your responsibility to ensure that You comply with the laws and driving regulations which apply in each state and territory of Australia in which You travel. 11.3 Your original licence and any formal translation of it (if applicable) must be presented by You in person at the time of collection of the Vehicle. If Your motor vehicle driver’s licence does not contain Your photograph, You must also present Your passport at that time. 11.4 If You do not comply with the requirements of this clause 11, or RedSands reasonably considers that, taking into account where You intend to travel, You are likely to breach this clause 11, RedSands may refuse to deliver the Vehicle and Camping Accessories (if applicable) to You. 11.5 All drivers of the Vehicle must be 25 years of age or older and be noted as a driver in the Rental Agreement. 11.6 The Vehicle must not be driven by any person other than those persons noted on the Rental Agreement as drivers. 12.1 The Vehicle and the Camping Accessories may only be used for recreational purposes in accordance with the terms of this Rental Agreement. 12.2 If the Rental Agreement includes the hire of the Camping Accessories with the Vehicle, the Vehicle and the Camping Accessories cannot be separated from each other. (l) on any unformed track. (d) across Yardie Creek in the Cape Range National Park. 12.5 In addition to the restrictions contained in clause 12.4, RedSands may need to further restrict where You may take the Vehicle and any Camping Accessories due to adverse road or weather conditions, and the distance to nominated destinations given the length of the Rental Period. RedSands will contact You to notify You of any additional restrictions that RedSands may deem necessary pursuant to this clause 12.5 and You agree to comply with those additional restrictions. (i) used to carry animals in the Vehicle, excluding registered disability dogs. (c) parking the Vehicle in locations which do not pose a material risk of Damage or exposure to hazards, including by falling trees or tree branches or the flow of water. 12.8 You must not, and You must not allow anyone else, to smoke in, or near the Vehicle or the Camping Accessories. (b) acquire any interest in the Vehicle or the Camping Accessories (by security or otherwise). 12.10 You must inform Yourself of, and comply with, all laws applicable to Your use of the Vehicle and Camping Accessories pursuant to this Rental Agreement. RedSands may require a safety check of the Vehicle (“Safety Check”) and You will be charged a fee of $275 for the safety check (“Safety Check Fee”). 13.3 You agree that You will be liable for any Damage reported as a result of the Safety Check, which Damage includes Loss of Use from the end of the Rental Period to the time that the Damage is rectified by repair or replacement. 13.4 Any Damage reported as a result of the Safety Check carried out under this clause 13 is excluded from any purchased 4WD Wander Far Coverage. 14.1 You may be required under the laws applicable in Australia to ensure that child car restraints are fitted to the Vehicle and used appropriately whilst driving with children in the Vehicle. (b) install the child car restraint in the Vehicle. 14.3 You agree that RedSands does not offer child car restraint advice and does not install child car restraints. 14.4 You agree that it is Your sole responsibility to ensure that appropriate child car restraints are fitted to the Vehicle, where necessary or appropriate. 15.1 During the Rental Period, You must take all reasonable steps to properly maintain the Vehicle, including daily checks of the oil, water and batteries, and You must contact RedSands immediately should any vehicle warning lights indicate any potential malfunction. 15.2 Emergency repairs of up to $100 may be carried out without authorisation and will be reimbursed by RedSands on presentation of a tax invoice, unless the repairs were on account of Damage for which You are liable under this Rental Agreement. For amounts over $100, RedSands must provide its prior approval before the amount is incurred. 15.3 In the event of breakdown, 24 hour emergency roadside assistance is available from the RAC WA and its interstate affiliates. 15.4 All tyres replaced by You on the Vehicle must be Bridgestone AT Dueler size 265/65/17 (“Compliant Tyres”). For safety reasons, You must not use other types of tyres on the Vehicle (“Non-Compliant Tyres”). 15.5 Unless You are covered for the cost of a replacement tyre or tyres under the 4WD Wander Far Coverage, You must pay for the cost of repairing or replacing tyres damaged during the Rental Period. (b) the replaced tyre is defective, returned by You to RedSands for inspection, and the manufacturer of the tyre accepts a warranty claim in relation to the tyre. 15.7 You acknowledge that You will not be reimbursed for any purchase of Non-Compliant Tyres in any circumstances, even if You have purchased 4WD Wander Far Coverage. (c) the amounts for which You provide RedSands an indemnity under clause 25. (iii) water or other contamination of fuel. (viii) You attaching or installing Your own equipment to the Vehicle. 16.3 If in RedSands’ reasonable opinion, the damage to the Vehicle or Camping Accessories is not repairable or is uneconomic to repair, You will be liable for the replacement cost of so much of the Vehicle or Camping Accessories that has been damaged. 16.4 Where there is more than one of You, Your liabilities under this Rental Agreement are owed by You jointly and severally. 17.1 You acknowledge that RedSands does not offer You insurance under this Rental Agreement. Instead, RedSands permits Your liability to RedSands to be reduced in limited circumstances set out in this Rental Agreement where a policy of insurance held by RedSands indemnifies RedSands for certain losses suffered by it. 17.2 You should make all relevant enquires to determine what insurance may be required by You in connection with the Rental Agreement, Your use of the Vehicle and Camping Accessories and Your travel arrangements generally. 17.3 You acknowledge that although compulsory third party motor vehicle insurance may cover certain claims made against You for personal injury caused by You or Your use of the Vehicle, RedSands recommends that You seek professional advice on the most appropriate choice of insurance for You. This includes, for example, appropriate travel insurance, vehicle insurance, health insurance, accident, emergency and hospital insurance. 18.1 Subject to Your payment of the applicable Excess for each claim in relation to the Vehicle or Camping Accessories, Your liability under clause 16.1 is reduced to the extent of the amount of any proceeds RedSands is paid on account of any claim made by it under an applicable policy of insurance RedSands may hold in relation to that liability. In the event that RedSands does not hold an applicable policy of insurance for all or part of Your liability, or the insurer refuses to indemnify RedSands in relation to a claim, Your liability (or that part of Your liability) under clause 16.1 is not subject to change. 18.2 Nothing in this Rental Agreement limits Your liability that may arise at law independently of this Rental Agreement. 18.3 The liability of a driver for causing personal injuries resulting from the use of the Vehicle is covered by statutory compensation schemes in each State and Territory. (b) provide all reasonable assistance to RedSands in making any claim including providing all relevant information to RedSands or its insurer. 19.2 After a claim is made, You must continue to provide all reasonable assistance to RedSands and its insurer, including attending any court or tribunal to give evidence or providing relevant documents if requested to do so. 19.3 The Excess is not payable by You in relation to a claim if RedSands is notified by its insurer that no Excess is applicable in relation to that claim. 19.4 If You pay the Excess and subsequently, RedSands is reimbursed for that amount from its insurer, RedSands will repay the amount to You after deduction of any other sums You may owe RedSands. 19.5 You acknowledge that it may take time for any insurance claim to be processed by RedSands’ insurer. RedSands is not obliged to pay any sums which may become payable to You in relation to, or as a consequence of any such claim until that claim has been resolved by the insurer. 19.6 Nothing in this Rental Agreement imposes any obligation on RedSands to take out any particular type of insurance policy or policies in relation to any risk associated with the Rental Agreement, the Vehicle or Camping Accessories or Your rental, possession or use of the Vehicle or Camping Accessories. 19.7 Where the Excess which would be payable by You in relation to a claim under an applicable policy of insurance is likely to exceed the amount of Your liability, RedSands will waive any requirement for You to pay the Excess provided that You remain liable for, and pay, Your liability. (b) RedSands elects, in its absolute discretion, to accept payment by You of an amount equivalent to the applicable Excess in full satisfaction of Your liability in relation to the proposed claim. 20.1 You acknowledge that even where RedSands holds a policy of insurance, that policy will not cover all of Your liability referred to in clause 16.1 above. (l) any of the matters specified in clause 22. 21.1 4WD Wander Far Coverage only applies when purchased by You prior to the time of commencement of this Rental Agreement. (b) You are entitled to be reimbursed by RedSands for certain limited types of Damage as specified in clause 21.7 in any event. 21.3 4WD Wander Far Coverage only applies to the liabilities expressly referred to in this clause 21. $49 per day (capped at $2,450). # Excludes Damage to the Vehicle or Camping Accessories caused by (i) the circumstances leading to the need for the Vehicle to be retrieved or recovered or (ii) the retrieval or recovery. You will remain liable for that Damage subject to any reduction in accordance with clause 18.1. $69 per day (capped at $3,450). (b) You are not liable for the Damage specified in clause 21.7(a). (b) You are not liable for the Damage specified in clause 21.7(b). (c) in the case of “4WD Wander Far Coverage – $500 Excess” for RedSands Toyota Prado Vehicles, the replacement of one (1) windscreen on account of Accidental damage, the replacement of two (2) tyres on account of Accidental Damage, and Vehicle retrieval and recovery costs of up to $5,000 (in the aggregate). (b) the retrieval or recovery. The amount for that Damage is not included in 4WD Wander Far Coverage and You will remain liable for that amount subject to any reduction in accordance with clause 18.1. (c) the amount of the liability is less than the Excess payable. (e) unless You purchase new 4WD Wander Far Coverage, you must pay the Bond. 21.11 For the purposes of assessing the cap on the daily charge for the new 4WD Wander Far Coverage referred to in clause 21.10(d) above, the date of the event is the first day, irrespective of the number of days for which You held 4WD Wander Far Coverage prior to the event. 21.12 If you purchase new 4WD Wander Far Coverage in accordance with clause 21.10(d), You are entitled to a credit for any daily charge paid in relation to the previous 4WD Wander Far Coverage for any day or days after the date of the event. If on, or prior to, the date of the event, a cap in relation to the previous 4WD Wander Far Coverage has been reached, You are not entitled to any credit under this clause. (iv) any loss or damage which is consequential upon any other loss or damage suffered by You, such as, for example, loss of income or lost opportunities. 22.2 You irrevocably discharge and release RedSands, its employees and agents, from any liability to You (regardless of who is at fault), for any loss or damage referred to in clause 22.1.
capped in the aggregate to a maximum amount equivalent to the total hire charges paid by You under the Rental Agreement. (h) report the accident to RedSands within 24 hours and provide RedSands with all reasonable assistance and information in relation to the accident. 23.2 If the Vehicle can no longer be safely used following an accident, RedSands will use reasonable endeavours to supply a replacement vehicle. The provision by RedSands of a replacement vehicle is subject to availability, Your location and the unexpired portion of the Rental Period at the time of the accident. 23.3 If a replacement vehicle is available, You are responsible for making Your own way to the nearest RedSands’ pick-up location at Your own cost. A new Bond or the purchase of a new 4WD Wander Far Coverage (if applicable) will be required for the exchange vehicle. The rental of the replacement vehicle will otherwise be on the same terms and conditions as this Rental Agreement, for the balance of the unexpired portion of the Rental Period. 24.1 By booking the Vehicle and Camping Accessories and paying any sum on account of their rental, You agree to be immediately bound by this Rental Agreement. 24.3 If You do not collect the Vehicle and any Camping Accessories from the location, and on the time and date specified in the Schedule, You will have breached this Rental Agreement. Even if you have not collected the Vehicle and any Camping Accessories you remain liable for 100% of the Total Hire Charge and are not entitled to any refund. 24.4 If, after deduction of the applicable charges calculated under this clause 24, there is a sum owing to You from RedSands, You will be refunded that sum within 21 days. (c) claims or demands by any person for Third Party Loss in relation to Your possession or use of the Vehicle or Camping Accessories. 25.2 Nothing in this clause 25.1 releases or indemnifies RedSands from any obligation of RedSands in circumstances where RedSands is found to have acted negligently. 25.3 Nothing contained in this Rental Agreement shall exclude any express or implied conditions, warranties or requirements that cannot be so excluded under the Competition and Consumer Act 2010 (Cth) or otherwise at law. 26.1 You are responsible for tolls and infringement notices for traffic and parking offences relating to Your rental of the Vehicle. 26.2 Unpaid tolls and infringement notices for traffic and parking offences relating to Your rental of the Vehicle may be received by RedSands. In the event an infringement or toll notice is received in relation to an event occurring during the Rental Period or otherwise when the Vehicle is in Your possession or control, RedSands will advise the relevant authority that You were the driver of the Vehicle at that time. The authority is then likely to issue the infringement or toll notice to You. 26.3 RedSands may charge You a processing fee of up to $75 for each infringement and toll notice to reimburse RedSands for the costs incurred in processing the notices. (e) RedSands reasonably believes the Vehicle or the Camping Accessories to be abandoned. 27.2 You acknowledge that in the event of such termination or repossession, You have no right to a refund of all or any part of the hire or other charges for the Rental Period. 28.2 You irrevocably authorise RedSands to charge to the credit card provided by You, an amount equivalent Your liability under this Rental Agreement or an estimate of that amount. 28.3 The authority referred to in clause 28.2 survives termination of this Rental Agreement and may be acted upon during or after the conclusion of the Rental Period. (l) clause 26 (Traffic Offences and Tolls). 28.5 If an amount is charged by RedSands pursuant to the authority given by this clause, RedSands will provide You with an itemised invoice of the money charged. 29.1 RedSands retains title to the Vehicle at all times. 29.2 You must not agree, attempt, offer or purport to sell, assign, sub-let, lend, pledge, mortgage, let on hire or otherwise part with or attempt to part with the personal possession of or otherwise deal with the Vehicle or the Camping Accessories. 29.3 RedSands may register any security interest held by it arising under, in connection with, or contemplated by this Rental Agreement on the PPSR without notice to You. To the extent permitted by law, You waive any rights you may have to receive notice of that registration or a change to that registration. 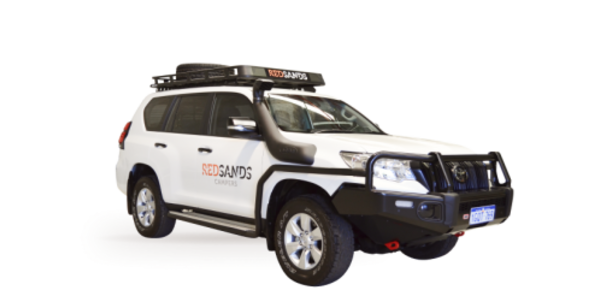 You agree to do all things that RedSands may reasonably require to ensure that RedSands has a perfected security interest in, and has priority over any other security interests in, the Vehicle and Camping Accessories. 31.1 The Rental Agreement is governed by and is to be interpreted in accordance with the laws applicable in Western Australia. Each party agrees to submit to the non-exclusive jurisdiction of the courts in Western Australia and any courts which have jurisdiction to hear appeals from any of those courts and waives any right to object to any proceedings being brought in those courts. 32.1 The Rental Agreement contains the entire agreement between the parties about the subject matter and supersedes all prior representations, statements, communications, negotiations, arrangements, understandings and agreements, either oral or written, between the parties with respect to the subject matter of the Rental Agreement. 33.1 Any provision of this Rental Agreement that is illegal, void or unenforceable is only ineffective to the extent to which the provision is illegal, void or unenforceable, without invalidating the remaining provisions.